Get your motor running! Head out to the Milky Way! 1500CC Turbostomper engine, Custom paint job by Pond Pimpin' Customs and built-in fondue system. 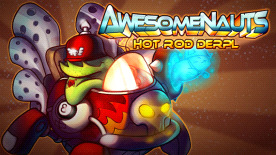 Turn heads on the intergalactic freeway as you cruise easy with Derpl's Hot Rod skin! This DLC contains a custom skin for Derpl Zork in Awesomenauts, and will automatically unlock the character if you have not already done so.